With the ongoing political situation, many TEBA members have expressed concern and a desire to be more well informed. TEBA arranged a special dinner discussion with Dr. Chaiwat Satha-Anand, a professor of political science at Thammasat University and is director of the Thai Peace Information Centre which conducts studies and activism in relation to the Thai military and social issues. 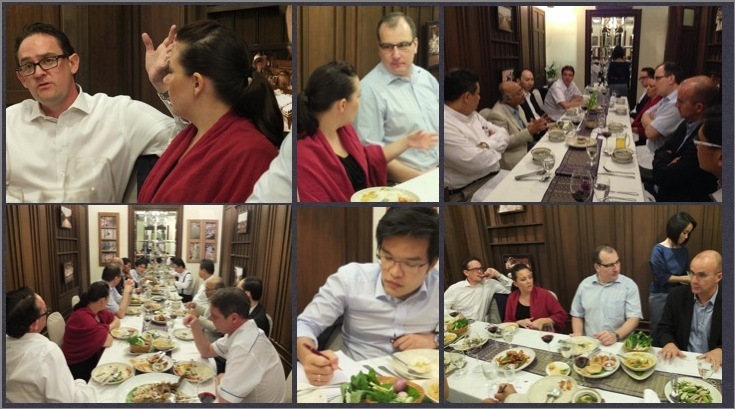 It was a good opportunity for European business leaders to come together to discuss the current political issues and their effects on business operations with a prominent Thai political expert. It was also a very good opportunity for businesses to share best practice about dealing with the current situation and general crisis management. Starting on Monday, 13th January, the protesters have announced a plan to “shutdown Bangkok.” Originally this was meant to involve 20 major intersections in the city being closed, however this has now been reduced to seven. As well as blocking traffic, the protesters have threatened to cut off electricity and water to members of the current caretaker government and government buildings. The protesters have said that the BTS and MRT lines will not be disrupted and that the airports will not be occupied. How long the “Bangkok Shutdown” will continue, it is currently hard to tell. TEBA will continue to provide updates on the situation to our members.